A new CAD consumer experience is being rolled-out by Logicom, which could significantly change the way retailers sell. 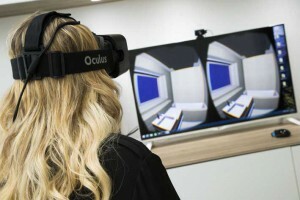 Launched at the May Design Series, Virtual Worlds 4D proved a popular attraction for visitors who queued up to don the futuristic headset and experience a 4D world. One or two sceptics suggested it was a techie gimmick, whereas most thought it could transform the showroom experience and prove an exciting new selling tool. The first installations are completed and the early indications are that this latest innovation could be a game changer. Virtual Worlds 4D is an adjunct to the popular Virtual Worlds Professional 3D interactive CAD software. Key to the technology is the Virtual Worlds unique interactive platform and the advanced, simulating headset. When worn by the customer, it places them centre stage, in the designed space. Look down and the customer sees an avatar of themselves, sitting in their new room. Designs in Virtual Worlds 4D appear with exceptionally realistic depth, scale and parallax, made possible by Virtual Worlds’ unique 3D modelling. Users of 4D have access to all the current product catalogues of a vast choice of KBB manufacturers’ brands. Each manufacturer has worked closely with Virtual Worlds to ensure their product collections are accurately replicated in 3D format and update their catalogues regularly. In 4D the 110 degree viewing angle places the customer directly in the room rather than looking in through a screen. The response to eye movement is immediate, facilitating 360 degree head-tracking and interaction with moving elements of the room, including opening cupboards, looking inside drawers and stepping into showers. 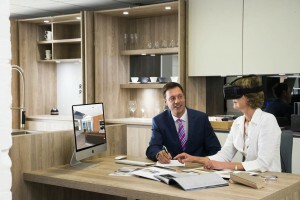 A first for the KBB sector, Virtual Worlds 4D claims to deliver a ground-breaking, virtual reality and interactive buying experience, which is compelling and optimises the sales potential of excellent design. Under a subscription known as Virtual Worlds One, Virtual Worlds 4D is bundled together with Virtual Worlds Professional interactive 3D CAD software, its Viewer App, 2D Planning and Pricing Module. The software specialist Logicom is behind Virtual Worlds and it is understood that more innovations are currently in development, which will be made available to all subscribers. Reese James is one of the first retailers to install 4D. Owned and managed by Nigel Mason, the company has a showroom located in Shirley, near Solihull. A hot spot for kitchen and bathroom showrooms, Reese James has three competitors within a five minute walk. Working in such close proximity to other kitchen and bathroom businesses is a key reason Mason was eager to sign up to the 4D package, as he explains. “Our whole approach is to offer the consumer a unique and outstanding experience from beginning to end. Having seen the 4D demo, I was sold hook, line and sinker. I knew our customers would be wowed and I wanted it immediately for our showroom. This is a major, major way that we are different from the guys down the road. The showroom is split 50:50 between bathroom and kitchen settings with Rotpunkt, Dornbracht and Laufen products on prominent display. Mason considers the technologically advanced 4D is in keeping with these brands and the company’s upmarket and forward-looking image: “I want customers to enter our showroom and be so impressed with what they see and the shopping experience we promise that they commit without delay. For us 4D is instrumental in achieving this”. Like Mason, Derek Waddington owner of Broadway Bathrooms in Putney, London was immediately excited by the whole concept of 4D: “I’ve used Virtual Worlds for five years now and love it. When I saw the 4D demonstration, I immediately thought it was for us. It’s an additional investment but our showroom is not that large and needs to work hard for us – I feel 4D will really help”. 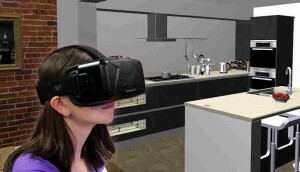 One of the key features of the technology is that the customer experiences their kitchen or bathroom as though they were walking through it in real life. The realism is impressive, so much so that both Waddington and Mason report that 4D provides the spacial awareness which so many customers lack. “Most customers struggle to grasp an overhead, 3D plan or flat render – however smart it looks. We find the 4D experience overcomes this problem entirely. They feel physically in the room and so they can see exactly how much space there is between the island units and the oven or the drawers fully extended and whether there is sufficient space for their requirements. It avoids all sorts of potential problems”, explains Mason. Waddington agrees: “We use Virtual Worlds a lot in the showroom as it is real time and in 3D. Customers can relate to what they are seeing − they really get involved with the design. I anticipate 4D is gong to be that much better”. As the customer physically experiences the room via the headset in 4D, the designer views the same design on a screen, only in 3D format. If required, adjustments to the design can be made and the customer can view the changes immediately. There is no additional work involved for the designer to go from standard 3D interactive stage to showing the customer the design in 4D. Waddington thinks the consumer experience of 4D could negate the requirement for producing high resolution renders entirely: “High quality rendering is slow and dated; I think there will be no need once the consumer has seen their design through the goggles – we’ll be talking to them at an entirely different level”. Installation of the new CAD technology has also made both retailers start to re-evaluate their approach to charging for design consultations. Like so many kitchen and bathroom retailers, Reese James does not currently charge for designs and Broadway Bathrooms do so rarely, both nervous of deterring potential clients. However, the introduction of the 4D experience is making them question this approach. Mason explains his thinking: “If you can bolt together an impressive showroom with strong design, personal service and add the wow factor of Virtual Worlds 4D experience, I am beginning to think a consultation fee could be feasible”.